Well, I've been home from my wild trip to Hollywood for about three weeks now, and I'm still recovering. You know when you get done with a crazy roller coaster ride and they dump you out in the exit area, and everyone's walking kind of slow and leaning against the walls? That's about how I've felt ever since I got home from Writers of the Future. In fact, it was such an intense experience that I've decided to break my recap of the events into a series of updates that I'll sprinkle out in the coming weeks. 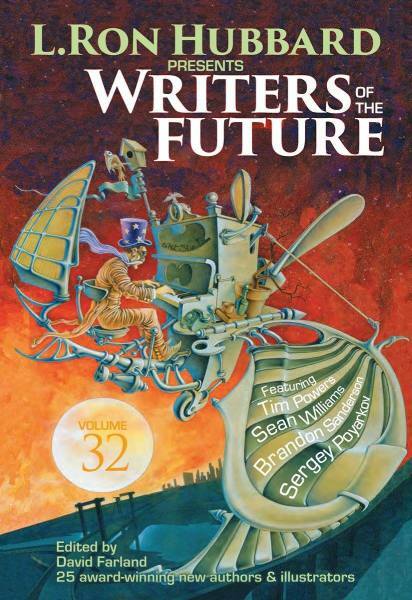 This is part one, and it's a great day to kick things off because Writers of the Future Volume 32 releases today! You can pick up a copy wherever books are sold. In honor of the book release, today's entry is all about my winning story, The Sun Falls Apart. After a year of secrecy, I can finally talk details! A crack between the boards revealed a meager smattering of light, but Caleb took any glimpse of the sun he could get. Thick wood and rusty nails denied it everywhere else in this house. Here in the old guest room, it struggled through. The razor-thin sunbeam cut a swath through the darkness and landed on his chest. Stepping into the light felt like stepping out the front door. I wrote the first draft of The Sun Falls Apart at Odyssey Writing Workshop in 2013. The pressure cooker environment of Odyssey forced me to produce a complete story on a tighter deadline than I’d ever experienced before (at the time, anyway--the 24-hour challenge at the Writers of the Future workshop has since blown that out of the water). I found myself turning toward an old idea that had been rattling around in my head for years. I had this image of two children locked inside a house by their parents with no idea of what the outside world looked like. I did my best to apply the knowledge Jeanne Cavelos had been dousing us with at Odyssey and produced a story called Daylight. After Odyssey, I came home burned out creatively, as is common for writers who go through intensive workshops. I needed time to digest all the knowledge swimming around in my skull before I could return to those stories. The draft that would become my 1st Place story languished in a cardboard box for a long time before I finally fished it out into the light. With the help of the feedback I’d gathered at Odyssey, I hammered that first draft into one of my favorite stories. Daylight became The Sun Falls Apart. I’m beyond delighted that it found its home with Writers of the Future. To read the rest of the story, pick up a copy of Writers of the Future Volume 32. Check out WOTF32.com for a handy list of purchase links, as well as previews of the other winning stories and profiles of the contributing writers and illustrators. Thanks, Krystal! I agree, the story takes as long as it takes. Sometimes that's not long at all.